The light to medium duty casters in the #20 series feature heat treated double ball bearing raceways for added strength and resistance to wear. They are all bright zinc plated, and use a 1/2" precision kingpin. These are both economical and highly versatile, and can be built with a wide variety of wheel types to meet the needs of a wide selection of applications. Bearing options include roller bearings, Delrin bearings, precision bearings, ball bearings, sleeve or plain bearings, and no bearing. Brake options and dust covers also available. Wheel diameters include 3", 3.5", 4", and 5" wheels. For additional information and ordering call 1-888-904-9531. 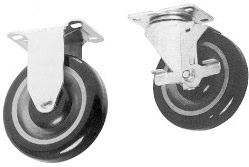 Common uses for these light-medium duty casters include material handling, bakery equipment, stocking carts, dollies, food service applications, office equipment, and anything that requires a strong, versatile caster.